Mueller completes his investigation: Was the collusion probe a witch hunt? And yet even as one legal cloud lifts with the conclusion of special counsel Robert Mueller's investigation, others loom large on the horizon – creating additional threats to the president's standing as he seeks to shift attention toward his 2020 re-election campaign. Nearly every organization Trump has run over the last decade remains under investigation by state or federal authorities, and he is mired in a variety of civil litigation, with the center of gravity shifting from Mueller's offices in southwest Washington to Capitol Hill and state and federal courtrooms in New York, the president's hometown and the headquarters of his company. Federal prosecutors in New York have been investigating hush money paid before the 2016 election to two women who said they had affairs with Trump. Prosecutors in that office are also probing Trump's inaugural committee, which raised and spent record amounts of money. The president's personal conduct will also be under the microscope in the coming months, when he is scheduled to sit for a deposition in a lawsuit filed in New York state by a former contestant on his reality television show who alleges he groped her in 2007 and then lied about it during the election. State authorities in New York, the District of Columbia and New Jersey are investigating a variety of issues related to Trump's private business and charity. Congressional Democrats have issued dozens of requests for information about various topics related to Mueller's investigation, the operations of Trump's White House and Trump's private business, and have signaled they will press forward with those matters. Trump told Fox Business Network's Maria Bartiromo on Friday that he and his lawyers were in the dark about any investigation other than Mueller. “They say there are lots of things, but I don't know about these things, OK, just so you understand,” he said. In New York, federal prosecutors have been active on two investigations that could cause problems for Trump, his family and other close associates. The status of the investigation is not clear. Cohen in May will begin serving a three-year prison term for his involvement in the scheme, as well as various financial crimes and for lying to Congress about efforts to build a Trump Tower in Moscow. When Cohen was sentenced, prosecutors announced they had reached a settlement with American Media Inc., the company that publishes the National Enquirer, for its role in paying off one of the two women – a possible sign the investigation into the payments had been concluded. But Cohen told Congress in public testimony recently that he was aware of potentially illegal behavior by Trump that he could not discuss because he believed it remained the subject of ongoing investigation by New York prosecutors. Meanwhile, federal prosecutors in Manhattan in February also issued a wide-ranging subpoena to the presidential inaugural committee, the entity that organized Trump's $107 million festivities when he took office in January 2017. The request sought documents covering nearly every aspect of the committee's activities. In addition, the committee has also received subpoenas from attorneys general offices in New Jersey and the District of Columbia, which are each investigating whether the nonprofit committee's spending fulfilled its charitable aims. Federal prosecutors are also scheduled to try one of Trump's oldest friends and confidantes, Roger Stone, in Washington in November. Stone has been charged with lying to Congress about his efforts to find out what material WikiLeaks held before the 2016 election. The anti-secrecy site upended the campaign by publishing emails from the Democratic Party and Hillary Clinton campaign chairman John Podesta that prosecutors have said were stolen by Russian operatives. Stone was charged jointly by Mueller's office and prosecutors in Washington. With the end of Mueller's probe, it appears likely the case will be taken over entirely by the District of Columbia U.S. attorney's office. Trump and his company are also facing a battery of investigations from state authorities in New York. New York Attorney General Letitia James, a Democrat, is suing Trump in state court because of what the state called “persistently illegal conduct” at Trump's 30-year-old charity, the Donald J. Trump Foundation. The suit says Trump used the charity's money to buy paintings of himself, to pay off legal settlements for his for-profit businesses, and to give his own presidential campaign a boost during the 2016 Republican primaries. Trump and his children Ivanka, Donald Jr. and Eric have also been sued; they were all technically members of a charity board that hadn't met since 1999, the attorney general's office says. Trump has agreed to shutter the foundation, but the case is still pending. In addition, Trump's company appears to be the focus of two new state inquiries that followed the congressional testimony by Cohen. Cohen told a House committee in February that Trump had submitted inflated summaries of his assets to both insurers and would-be lenders, seeking to mislead them about the state of his net worth. After that, state authorities sent subpoenas to Deutsche Bank and another bank that loaned money to Trump, and to Aon, Trump's longtime insurance broker. State investigators in both New York and New Jersey have spoken to an attorney for undocumented immigrants who worked for years at Trump's golf clubs, according to the attorney. In January, the company fired at least 18 workers – many of them longtime employees – after an audit found that their immigration documents were fraudulent. Neither the New York nor the New Jersey attorney general has commented, nor have they confirmed that they had opened investigations. Trump is also facing two federal lawsuits alleging that he has violated the Constitution because his private company continues to do business with foreign governments. The Constitution prohibits presidents from taking “emoluments” from foreign states, or the governments of individual U.S. states. One of Trump's most pressing legal perils comes from a civil lawsuit filed in New York by Summer Zervos, a former “Apprentice” contestant. A New York appellate court this month denied a request by Trump to dismiss the suit. His lawyers have said they plan to appeal, but if the ruling stands, it means Trump would likely have to sit for a deposition in the matter in coming months. He would face questions about Zervos's allegations. Her lawyers would probably seek to ask the president questions about his treatment of other women. Trump could face serious consequences if he were to lie in the deposition. After all, the impeachment of President Bill Clinton began after he was accused of lying in a deposition in a civil sexual harassment suit filed by Paula Jones. Novelist Don Winslow has spent 20 years chronicling the war on drug cartels south of the U.S. border that have triggered unspeakable violence and caravans of asylum-seekers searching for safety in the U.S. His new novel “The Border" is the concluding work of a trilogy that was born out of a single news story in the late-1990s. Jeff Greenfield recently sat down with Winslow to learn more. President Trump has not been shy about slamming the Russia investigation. So why has he said nothing about it ending? Special counsel Robert Mueller's report on his investigation of Russia's interference in the 2016 election is in the hands of the attorney general who says he’ll release his “preliminary conclusions” this weekend. How much of the full report becomes public is already the subject of debate. NYU law professor Ryan Goodman joins Hari Sreenivasan to discuss what’s next. WASHINGTON (AP) — Attorney General William Barr was reviewing the special counsel’s confidential report on the Russia investigation Saturday to determine what should be made public after a nearly two-year probe that cast a dark shadow over Donald Trump’s presidency. The Justice Department was expected to release the main findings as soon as Saturday, and Barr was at the department’s headquarters going over Robert Mueller’s report, a person familiar with the process said. The person requested anonymity to discuss Barr’s work. The attorney general ignored reporters’ questions as he arrived at work. Trump, who has relentlessly criticized Mueller’s investigation as a “witch hunt,” was at his golf club in Florida on Saturday, and House Democrats were planning to gather by phone later in the day as they waited for Barr’s summary. With no details released at this point, it was not known whether Mueller’s report answers the core questions of his investigation: Did Trump’s campaign collude with the Kremlin to sway the 2016 presidential election in favor of the celebrity businessman? Also, did Trump take steps later, including by firing his FBI director, to obstruct the probe? That was good news for a handful of Trump associates and family members dogged by speculation of possible wrongdoing. They include Donald Trump Jr., who had a role in arranging a Trump Tower meeting at the height of the 2016 campaign with a Kremlin-linked lawyer, and Trump’s son-in-law, Jared Kushner, who was interviewed at least twice by Mueller’s prosecutors. It wasn’t immediately clear whether Mueller might have referred additional investigations to the Justice Department. All told, Mueller charged 34 people, including the president’s former campaign chairman, Paul Manafort, his first national security adviser, Michael Flynn, and three Russian companies. Twenty-five Russians were indicted on charges related to election interference, accused either of hacking Democratic email accounts during the campaign or of orchestrating a social media campaign that spread disinformation on the internet. How will Trump's administration impact you? The mere delivery of the confidential findings set off swift demands from Democrats for full release of Mueller’s report and the supporting evidence collected during the sweeping probe. As Mueller’s probe has wound down, Democrats have increasingly shifted their focus to their own congressional investigations, ensuring the special counsel’s words would not be the last on the matter. It was not clear whether Trump would have early access to Mueller’s findings. Spokeswoman Sarah Sanders suggested the White House would not interfere, saying “we look forward to the process taking its course.” But Trump’s personal attorney, Rudy Giuliani, told The Associated Press Friday that the president’s legal team would seek to get “an early look” before the findings were made public. The White House did receive a brief heads-up on the report’s arrival Friday. Barr’s chief of staff called White House Counsel Emmet Flood on Friday about 20 minutes before sending the letter to the Republican and Democratic leaders of the Senate and House Judiciary committees. The chairman of the Senate panel, Lindsey Graham of South Carolina, was keynote speaker Friday night at a Palm Beach County GOP fundraising dinner at Trump’s Mar-a-Lago resort. Trump made brief remarks to the group but did not mention the report, according to a person who attended the event, which was closed to the press. No matter the findings in Mueller’s report, the investigation has already illuminated Russia’s assault on the American political system, painted the Trump campaign as eager to exploit the release of hacked Democratic emails to hurt Democrat Hillary Clinton and exposed lies by Trump aides aimed at covering up their Russia-related contacts. The special counsel brought a sweeping indictment accusing Russian military intelligence officers of hacking Clinton’s campaign and other Democratic groups during the 2016 campaign. He charged another group of Russians with carrying out a large-scale social media disinformation campaign against the American political process that also sought to help Trump and hurt Clinton. Donald Trump is doing Gerhard Schroeder's bidding: The Reunification of Koreas. How much did they pay you, Gerhard? Your new Korean wife is just a fringe benefit and the communication channel. You and your bosses from the New Abwehr must have been paid quite nicely by all those high-tech companies interested in acquiring the cheap North Korean real estate or mostly the land, ah, weren't you, little petite bourgeois Social Democratic German grandiose hypocrite? Trump is the lackey of the German Social Democracy (Nationalistic, cheap, calculating), which serves as the front for the New Abwehr. The pragmatic and most evident roots of this dependency are in the Trump's huge, up to $10B probably, indebtedness to the German and Russian Banks and the imminent threat of the new and final, total bankruptcy or death by the Mafia bullet. In this sense Trump is a direct follow-up to Obama Presidency. Obama was the almost open and quite willing agent and the obedient lackey of the German Social Democracy; Trump is their masked but no less obedient and willing lackey. It looks like the New Abwehr saw their (Yes, their!) Operation 9/11 as the watershed event marking and celebrating their claimed dominance and the manipulations of the US and the World affairs. It was followed by the Operation Obama and the Operation Trump. In 2008, President George W. Bush overruled his more hard-line advisers to ... Read: Is Trump giving up on a nuclear-free North Korea? ... elicit a deal, Trump's and Kim's lieutenants are unlikely to produce their own breakthrough. ... to trade Pyongyang's entire nuclear arsenal for the lifting of all sanctions. 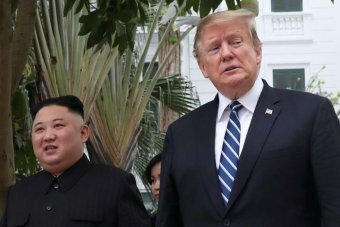 President Trump abruptly yanks sanctions on North Korea because he 'likes' ... Donald Trumpappeared to overrule his own Treasury Department on Friday and .... The Latest: Defense expertsupports cop who shot black teen. Sen. Chuck Schumer (D-NY) calls for Attorney General William Barr to release the full Mueller report to the public and stresses that he should not give President Trump a sneak-peek. Robert Mueller’s latest service to America is all but complete. But the reverberations from his yet-to-be-revealed report could amount to inestimable political and constitutional consequences. The conclusion of the special counsel’s investigation was an important landmark in itself, at a moment in America’s modern history when governing institutions are under intense strain. It demonstrated that so far at least, a credible legal examination is possible into the most explosive of charges against an unchained President, without interference and despite the bitter polarization of the times. The question now is whether everyone accepts the result. The nation could learn within days whether Mueller answered key inquiries: Did Trump cooperate with a hostile foreign power to win the 2016 election? Did he use that platform to seek to enrich himself with multi-billion dollar business deals in Russia? Did the President obstruct justice, including by firing FBI Director James Comey, in an effort to cover it all up? And is there any evidence to suggest why Trump often appears to be obedient to Russian President Vladimir Putin, following fears felt deep within the FBI that the US President was compromised? And can he explain the multiple suspicions contacts between Trump’s associates and Russians — both before and after the election — and the lies they all told about those relationships? Trump’s team is already celebrating, claiming it is already clear that the President has already been vindicated since Mueller did not indict anyone for cooperating with Russian election meddling. The lack of charges against Trump’s son, Donald Jr. and his son-in-law Jared Kushner, who were involved in a 2016 Trump Tower meeting with Russians offering “dirt” on Hillary Clinton, especially disappointed his critics. Their escape proved the shrewdness of Trump’s consistent messaging that the only question that mattered in an investigation that held Washington spellbound for two years was whether there was collusion. “The fat lady has sung,” one Trump aide told CNN’s Jim Acosta. For now, consistent with Mueller’s tightly controlled investigation, no one outside the Justice Department knows what is in the report, how long it is and how much it deals with the President’s own actions. But its delivery sets up an even bigger test for Washington’s political institutions than those involved in getting it safely to its culmination. So much political and emotional capital has been invested in Mueller’s probe by partisans on all sides that it’s already clear that it will not mark a moment of catharsis that will once and for all drain the bitter poison of the 2016 election. Mueller is sure to anger millions of Americans who do not find validation for their set-in-stone political convictions in an assessment that could conceivably dictate the fate of the Trump presidency. The choices made in the coming days and the revelations to come are likely to ensure that whatever Mueller’s report says, the question of Russia’s assault on the last presidential election will stain the next one in 20 months. Attorney General William Barr, a pillar of the legal establishment, weeks into his second spell in the job, now assumes the crucial historic role of deciding how much of the report the White House will initially see, and the extent to which Mueller’s conclusions will be shared with Congress and the public. Still, even if there is not legal liability for the President or his family in the Mueller report, it could still inflict significant political damage. The biggest peril for Trump always lay in the obstruction question and whether there was conduct on his part that Mueller could not charge in deference to the tradition that a sitting President can’t be indicted. Democrats wasted little time in demanding the full and swift release of Mueller’s entire report, seeking the evidentiary haul behind to power their own investigations. But they have a sensitive set of decisions as well. If the report in any way vindicates Trump, Democrats could endanger their new House majority by continuing to pursue him aggressively. Republicans will argue that if Mueller, a decorated former Marine and ultimate Washington straight arrow, clears Trump, a new flurry of investigations would amount to presidential persecution. However the political battle shapes up, it’s important to realize that the Mueller probe — though it has dominated Washington’s attention for nearly two years — is only one piece of the legal puzzle gathering around Trump. It is unclear how much evidence Mueller can present on the question of contacts between Russians and people in Trump’s orbit since the counter-intelligence side of the investigation — which could still be going on at the FBI — involves classified information, sources and methods. There are also multiple criminal and civil cases threatening Trump, his businesses, his inaugural committee and his presidential transition. The most perilous appears to be one launched by the US attorney’s office in the Southern District of New York that has already implicated Trump in campaign finance offenses over hush money payments made to women who alleged affairs with him before the election. Then there are multiple investigations launched by Democratic House committees that if they do not result in grounds or the political motivation for an impeachment drive, could be used to make a case against Trump to lay before voters in 2020. Where do Barr and Mueller go from here? Barr spent several hours reading the Mueller report in his office after the special counsel handed it over just before 5 p.m. ET on Friday afternoon. Now he must decide whether there are sufficient grounds to share parts of it with White House lawyers in anticipation of executive privilege assertions — a move that could give Trump and his team the chance to mount a pre-emptive defense. In a surprise, a Justice Department official said that Barr could brief lawmakers on his takeaways from the Mueller report as soon as this weekend. That means that the crucial answers from Mueller’s investigation could emerge publicly more quickly than expected. Still, a constitutional showdown still seems likely. Evidence gathered by Mueller about the firing of Comey, the President’s conversations about Russia with his fired national security adviser Mike Flynn and his conversations with aides about the Trump Tower meeting once he was President could all be subject to executive privilege assertions. Democrats with subpoena battle could then launch a court battle that could drag on for months. And Democrats are already threatening action if the whole of the report, and all of its supporting evidence is not quickly released. They also may call on the special counsel to explain himself in person. “I think the American people need to hear from Mr. Mueller,” said California Democratic Rep. Eric Swalwell, who sits on the House Intelligence Committee, on CNN. Will he, for instance, confine himself to an examination of criminal matters — and a explanation of the charges he laid against 37 people and entities, including associates of Trump like former campaign chairman Paul Manafort and Trump’s ex-attorney Michael Cohen and his reasons for not charging other key players? Or has the special counsel told a story of political offenses committed by the President and his team, that could be potentially relevant to the question of impeachment? How has he dealt with the intense public interest in his investigation and the President’s conduct — and the wider mission of uncovering and explaining an attempt by Russian intelligence agencies to sway the 2016 election to Trump? It must have come as a huge relief for the President that no one in his immediate family was indicted and Mueller did not lay charges on the question of conspiracy to collude with Russia to interfere in the election. There have been plenty of dark days for the President during the Russia investigation. But the news that Mueller would make no more indictments arrived as he settled into his Mar-a-Lago resort for a weekend with friends — surrounded by his legal and political teams. One person close to Trump told CNN’s Pamela Brown that “we won” and that the campaign — which has been tainted for two years by the suggestion of wrongdoing — was absolved. “Zero indictments mean we’re clear,” the person said. Trump’s legal team can also claim a victory since they were able to protect their client by not permitting him to sit for an interview under oath with Mueller — a situation that could have exposed the President to the possibility of perjury. The President did provide answers to written questions filed by Mueller, with the help of his counsel. Still, the President’s team faces nervous hours until they can learn the entirety of the report. Whether Mueller finds a pattern of repeated obstruction by the President remains a mystery. It’s also possible that the special counsel outlines a pattern of behavior related to Russia, that if known by voters before November 2016, would have appeared deeply unpatriotic and made it impossible for him to win the presidency. While there was a mood of celebration in the Trump camp on Friday night — things could quickly change. The President has made clear that if Mueller delivers a result favorable to him, he will see the report as accurate and fair. Despite months of angry tweets and comments insulting Mueller and his team, the President is likely to quickly pivot to using the special counsel’s sterling reputation to his own advantage. But if he is criticized in the report, it will validate in his own mind, the endless claims that the whole exercise was a “witch hunt” all along. The President’s legal team has gamed out a range of strategies to cope with a report that is highly critical of Trump, that is mixed, or offers him a measure of validation, CNN has reported. Indications that Barr may be able to brief lawmakers soon about the report sparked immediate speculation, alongside the lack of new indictments, that the Mueller report could be more favorable to the President than expected. Democrats appeared to be preparing for that possibility by stressing that the report was just the beginning of a new phase of the Russia intrigue. In a statement, House Speaker Nancy Pelosi and the top Senate Democrat, Chuck Schumer, warned that Barr should not give the White House a “sneak preview” of the report. In an apparently coordinated messaging blitz, key Democratic leaders and presidential candidates issued statements demanding the immediate public release of Mueller’s entire report and evidence backing it up. Such a trove would be valuable for the multiple House committees that are delving into almost every aspect of Trump’s business and political affairs. House Intelligence Committee Chairman Adam Schiff made clear that his investigation would look at questions that may not be covered by Mueller, including why Manafort gave polling data to a Russian contact with links to Kremlin intelligence agencies. He also pledged to look at whether Trump was compromised by his business or other links with Russia from before he became President. “If they are not answered, we are going to have to answer them,” Schiff told CNN’s Wolf Blitzer. His comments showed that while Mueller’s decision to file a report and end his investigation was a milestone moment, it was also the start of a new beginning of the Russia saga. NPR's Scott Simon talks with Andrea Bernstein, co-host of the podcast Trump, Inc., from WNYC and ProPublica, about the legal threats facing President Trump beyond the Mueller investigation. Trump-Russia inquiry: What might Mueller report look like? It's been 22 months since former FBI Director Robert Mueller was appointed to head a special investigation into Russian interference in the 2016 presidential election and whether the Trump campaign was involved. Now his work is done and his report has been submitted to the Department of Justice. But what does that mean? Time Magazine senior editor Ryan Teague Beckwith has described trying to keep up with the twists in the Mueller investigation as akin to understanding the plot of a Russian novel by listening to a book club conversation. Now, at last, perhaps we will see the full manuscript. Or at least the CliffsNotes (that's York Notes to you Brits). If it all seems confusing, that's because no-one knows exactly what happens next. It doesn't mean we'll know all the details immediately - or ever. The notoriously tight-lipped former FBI director could simply announce that his work is done, pack his bags and go back to a private life of golf clubs, corporate boards, academic speaking engagements and trips to the Apple store Genius Bar. Wait, won't there be a final 'Mueller Report' with all the juicy details? Not necessarily. In fact, probably not. It doesn't seem likely there will be a detailed investigative narrative presented to the public similar to the multi-tome report produced by Independent Counsel Kenneth Starr back in 1998. Mr Starr's wide-ranging investigation that started with a real-estate inquiry and ended up scouring Bill Clinton's affair with Monica Lewinsky was governed by a federal statute with different rules. And Mr Starr himself - a former judge and Republican administration lawyer - was a different kind of man to the by-the-books ex-Marine Mueller. Mr Mueller's probe is conducted under the auspices of the Justice Department and is governed by its regulations. The special counsel's obligations at the conclusion of his work are to provide a "confidential report" to Attorney General Bill Barr explaining his prosecutorial decisions. Mr Barr must then provide the top members of the Senate and House Judiciary committees with a brief explanation of any actions taken - or instances where he overruled the special counsel's proposed action. It is up to the attorney general to decide whether it would be in the "public interest" to make any of these reports or communications accessible to the rest of us. What will Bill Barr do? This is the million-dollar question. In his testimony during his January Senate confirmation hearings, Mr Barr was repeatedly pressed by Democrats to promise he would make public any findings or reports produced by the Mueller investigation. He demurred. Now, in his just-released letter to senior members of Congress, the attorney general seems eager to tell us more. "I am reviewing the report and anticipate that I may be in a position to advise you of the Special Counsel's principal conclusions as soon as this weekend," he writes. Traditionally the Justice Department has been reluctant to provide information about investigations that do not lead to criminal prosecution. That was a guideline notably violated by former FBI Director James Comey during his July 2016 press statement outlining the results of a federal investigation into Hillary Clinton's use of a private email server while she was Barack Obama's secretary of state. It would be ironic, to say the least, if the resulting political fallout from Mr Comey's decision - which Ms Clinton's campaign believes dealt a mortal wound - is used by Mr Barr to defend a decision to keep confidential damaging details of the Mueller investigation involving Donald Trump. His letter concludes: "I remain committed to as much transparency as possible, and I will keep you informed as to the status of my review." So we may not know everything? It's certainly a possibility. Or if we do learn something, it could take a while to render it into a form for public consumption (or, given the way things work in Washington, to leak). Imagine the scene in Washington, as the political world learns Mr Mueller has provided his findings to Mr Barr and then waits - for hours, days - to learn what, if anything, will come of it. There is another possibility, however. Up until now, Mr Mueller has spoken through his court filings, which are rich in detail and new revelations. While Mr Mueller's report to the attorney general will be confidential, it may not be his final word at the conclusion of his investigations. There may be more indictments to come. Over the course of the last 21 months, Mr Mueller - in his prosecutorial documents - has explained how Russian agents and operatives allegedly gathered information about the US political process, initiated a social media campaign to influence and enflame American political views, funded on-the-ground political activities, and hacked the emails and files of top Democratic operatives in an effort to damage Mrs Clinton's presidential campaign. He has prosecuted multiple members of the president's inner campaign circle for a variety of misdeeds, including obstruction of justice and lying about Russian contacts. He helped strike a deal with Mr Trump's personal lawyer, Michael Cohen, which unearthed evidence of Trump business negotiations with Russian officials conducted in the heat of the 2016 presidential campaign. He indicted a Trump confidant, Roger Stone, for lying about his contacts with Wikileaks, the organisation he says was the conduit through which Russia injected its purloined material into the American political bloodstream. The special counsel could be building a prosecutorial path that leads to the White House, with the final stones about to be set. Court-watchers note multiple sealed indictments have been filed in the federal courts used by Mr Mueller's team over the past few months. Those could be political and legal bombs, with their fuses lit. Or they could be duds. Hardly. Even if the Mueller investigation closes up shop and there is no "report", there are no new indictments and the attorney general's public pronouncements provide few details, it's not the end of the story. There are a number of cases initiated by the special counsel - involving Former National Security Advisor Michael Flynn and deputy campaign aide Rick Gates - that still await final sentencing. Former campaign chairman Paul Manafort has been jailed for fraud and for conspiracy related to illegal lobbying. Long-time Trump adviser Mr Stone has yet to go to trial on his charges of lying to Congress, witness tampering and obstruction of justice. Mr Mueller has handed this prosecution over to government lawyers. There's also a special counsel case against Concord Management and Consulting, which Mr Mueller has charged with assisting Russia's 2016 social media election-meddling campaign. Meanwhile there's a plethora of other ongoing investigations that are being run independently of the special counsel's office. Federal investigators in New York are looking into possible election-law violations by the Trump campaign and his businesses and misconduct by the Trump inaugural committee. The US attorneys in Washington and Virginia also have their hands full, with the espionage case involving Russian Maria Butina and an unregistered foreign lobbying prosecution of Mr Flynn's business associates. There are also state-level investigations of Mr Trump's charitable foundation and Trump Organization tax filings, as well as an ongoing lawsuit by Maryland and the District of Columbia alleging that the president, through his business dealings, is violating a constitutional rule prohibiting the acceptance of money from foreign governments while in office. Mr Mueller may exit the stage, but the drama will continue. WASHINGTON (Reuters) - President Donald Trump's son-in-law Jared Kushner is cooperating with a wide-ranging probe by the U.S. House Judiciary Committee into Trump and possible obstruction of justice and abuse of power, a person knowledgeable about the matter said on Friday. Just hours earlier, a lawyer for Trump adviser Roger Stone said in a letter seen by Reuters that Stone was not cooperating with the same committee and cited his right to avoid self-incrimination under the Fifth Amendment of the U.S. Constitution. As a cloud of legal risk darkened over Trump, he was spending the weekend at his private club Mar-a-Lago in Florida. Kushner submitted documents to Nadler's panel on Thursday in response to a wave of document requests sent by the committee on March 4, the knowledgeable person said. Kushner's attorney Abbe Lowell, who received the committee's document request, was not immediately available for comment. Democrats in the House of Representatives have launched numerous inquiries into Trump, his presidency, his family and his business interests. The Mueller investigation has been focused on the election and whether Trump's campaign colluded with Moscow in its effort to sway U.S. voters in Trump's favor. Although Mueller's report is finished, its contents were not yet known late on Friday. Details were expected soon. Russia has denied U.S. intelligence agencies' findings that the Kremlin interfered in the 2016 campaign. Trump has denied any collusion and dismissed Mueller's probe as a "witch hunt." Among the Judiciary Committee's aims are determining if Trump obstructed justice by ousting perceived enemies at the Justice Department and abused his power by possibly offering pardons or tampering with witnesses. It was not clear how much material Kushner provided to the committee. But investigators sought documents from him on more than two dozen topics. Those topics ranged from a June 9, 2016, Trump Tower meeting with a Russian lawyer who claimed to have damaging information about Democratic presidential nominee Hillary Clinton to any Trump transition team contacts with Russia. Stone's lawyer Grant Smith said in the letter to Nadler that Stone faces federal criminal charges and that it "is not in Mr. Stone's best interest" to participate in any other proceedings. Smith called Nadler's demand for documents a "fishing expedition request." Stone, who is under a gag order from the judge hearing his criminal case, had no comment. House Intelligence Committee Chairman Rep. Adam Schiff (D-CA) says that he will subpoena special counsel Robert Mueller if the full details of the report into Russian interference in the 2016 election are not made public. Shortly after the Justice Department confirmed that special counsel Robert Mueller delivered his final report on the Russia probe, Democratic Sen. Chuck Schumer said it was now "imperative" that Attorney General William Barr make it available to the public. "Attorney General Barr shall not give President Trump, his lawyers or his staff any sneak preview of special counsel Mueller's findings or evidence. And the White House must not be allowed to interfere in decisions about what parts of those findings or evidence should be made public." Schumer said the "American people have a right to the truth." Senate Minority leader Sen. Charles Schumer (D-NY) called on Attorney General William Barr to make the full Robert Mueller report on the Russian interference in the 2016 election to be made public and urged no "sneak peeks" for President Donald Trump. The contents of the special counsel report, nearly two years in the making, are a tightly guarded secret, but Mueller has recommended no further indictments. For 22 months, the special counsel has let his indictments and court filings speak for themselves with 34 people charged and seven people pleading guilty. There are early indications that the Mueller report does not recommend any further indictments beyond those brought during the nearly two-year investigation. If true, does that mean President Trump is cleared of wrongdoing? Judy Woodruff talks to former federal prosecutor Amy Jeffress and former Justice Department official John Carlin about the “fact-gathering” nature of the investigation. Former assistant director of the FBI Frank Figliuzzi, former US attorney Chuck Rosenberg, former DOJ spox Matt Miller and former CIA Director John Brennan on the many tentacles of Mueller’s investigation that will kick into high gear once the final report is filed.